Today’s communications world is digital. The movement to digital distribution is happening across the entertainment industries, including music (mp3s), movies (HD, 3D), online publishing as well as broadcast and cable TV. Cable technology has become increasingly digital over the past decade. New developments and consumer and business demands are accelerating this trend. The first took place in early 2009, with the government-mandated Digital Broadcast Transition. Congress told television broadcasters to stop transmitting their over-the-air signals in an analog format and broadcast only in a digital format by Feb. 17, 2009. The Digital Broadcast Transition did not affect any consumer who watches television through cable or satellite, but did affect all consumers who received television signals over-the-air through roof-top antennas or “rabbit ears” on their TVs. 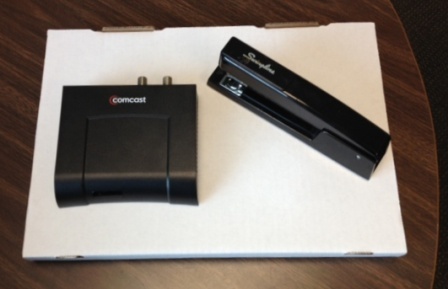 The Digital Transport Adapter, pictured at left next to a stapler for scale, allows people to see digital channels on a TV. A DTA is much smaller than the traditional “cable box” most people imagine. About the same time as the government mandated digital transmission of over-the- air signals, Comcast in Washington State began the transition of its “Standard Cable” channels from analog to digital. By December 2009, Comcast completed the transition of its “Standard Cable” level of service — roughly channels 30-70 — from analog to digital format. The move to digital freed up bandwidth and enabled Comcast to bring customers more channels, additional HD choices, more content On Demand, faster Internet speeds and new cross-platform services such as Xfinity Home. The third and final step in the movement to deliver video services exclusively in a digital format is beginning now. We will gradually convert the “Limited Basic” services — roughly channels 2-30, 72-79, 95-99 — from an analog to a digital format to add more bandwidth, deliver more channels, more On Demand content, more HD and eventually faster Internet service. Comcast is continuing its digital upgrade in Washington and will begin delivering its Limited Basic service exclusively in digital format beginning in some areas this fall. This move to exclusive digital delivery allows all Comcast customers to receive digital quality picture and sound, as well as more information and entertainment choices. In order to continue receiving the Limited Basic channels on most TVs after the migration, customers will need a digital cable box or a Digital Transport Adapter. Similar to Comcast’s offer when we upgraded the Expanded Basic service to digital, we’re providing up to three Digital Transport Adapters, small cable equipment we call DTAs, for our Limited Basic customers at no additional charge The average home has 2.8 television sets, which means that we will make this change at no additional cost to those affected by this change. See below for more information about people who want more DTAs. Comcast’s goal is to make this process as easy as possible for customers. First, as we transition to this new digital network, we will continue to offer the channels in analog. As we upgrade them exclusively to digital, we will discontinue the analog delivery only after we’ve extensively communicated with customers through letters, direct mail, bill messages, and automated voice messages. People will get plenty of notice about the need for new equipment. This change will not be a surprise to people who read their mail and answer their phone and/or listen to their voice messages. See below for more details about all the ways that someone will know when the change is coming to their area. To get the equipment, customers can log on to www.comcast.com/digitalnow or call 1-877-634-4434. A representative will be happy to assist and mail the self-install adapters to customers. Any CableCARD compatible devices can continue to access any level of service with an authorized CableCARD. So here’s the bottom line: The vast majority of our customers–more than 90 percent–already have digital service and will not be affected by these changes. However, Limited Basic customers or customers using an analog TV with Limited Basic service (and not using a CableCARD) will need to contact us to receive either a cable box or digital adaptor to continue receiving these channels after the transition. We will provide up to three digital adaptors at no additional monthly cost. By moving to all-digital, Comcast can continue to offer our customers more HD channels and faster Internet speeds. Comcast is continually listening to our customers and making the investments needed to exceed their expectations and give them more products and services. Our strategy has been about giving customers “more” – more HD, more choice and more speed online. This is about giving customers more of what they love and sets the stage for Washington to receive the benefits of an advanced digital network that allows for new technology and services, today and tomorrow, including more of the best HD channels, faster Internet speeds, interactive phone services and much more. Xfinity TV offers the best television viewing experience and unparalleled choice for our customers, which includes more than 300 channels, the most HD choices, content from hundreds of programmers, the most live sports and tools and features to manage TV viewing across multiple screens. By enhancing our network to an all-digital distribution, we are able to bring our customers more choices, faster Internet and new digital products and services. More than 85,000 TV shows and movies are available anytime on Xfinity On Demand, XfinityTV.com and through the Xfinity TV app. 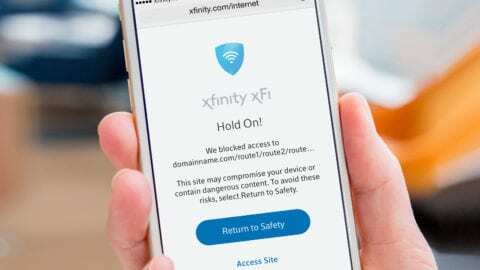 Xfinity TV brings viewers the best HD experience anytime, anywhere, including the most HD choices, up to 150 HD channels and 8,000 HD On Demand TV shows and movies—on TV and online. Xfinity Streampix™, a subscription video service, enables users to instantly stream deeper-library movies and TV shows in and out of the home. Xfinity TV offers a suite of tools to personalize and manage viewing across screens [rDVR, www.Xfinity.com/tvapp, Xfinity, search, filters, Queue]. We will bring the richness of our content to additional connected devices in the coming months. For example, we are rolling out AnyPlay™, a device which enables live TV on a variety of Internet-enabled displays in the home. We are also set to roll out our entertainment choices on devices such as Samsung-connected TVs and the Motorola Xoom Tablet as well as gaming consoles, tablets and mobile devices. Q. When will this channel migration happen? A. 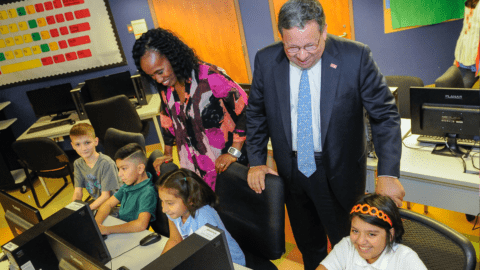 Our schedule calls for parts of Snohomish and South King Counties, including Everett and Federal Way to be among the first areas to go all digital early this fall with Tacoma and the Burien areas following late this year. Seattle, Bellevue, Bremerton and Spokane customers are expected to make the transition next year. Our goal is to have all of our customers fully upgraded to all digital by Spring 2013. However, keep in mind that this schedule is subject to change, and that our first priority is to ensure a smooth transition for our customers. Q. Who will be affected? A. Comcast customers who are currently watching Comcast service on a TV set that is not connected to a Digital Set Top Box, DTA, or CableCard will be affected. Any TV connected to a Digital Set Top Box, DTA, or CableCard is already prepared for this upgrade. Q. How are you notifying your customers? A. We are notifying customers in a variety of ways, well in advance of the cutover, giving them plenty of time to make preparations so they can continue to receive their Limited Basic channels. Each customer will receive a letter either 45-60 days prior to their neighborhood moving to all-digital. We will send a second letter 30 days prior to the transition. Customers will receive a phone call 15 days prior to the switch. A “Reminder Slate” will run for 2 weeks on the vacated channels after programming has been removed. Finally, customers who still haven’t made the transition following the cutover to all digital will receive a letter letting them know what they need to do in order to receive their channels. Q. How many customers will this new change impact? A. The vast majority of our customers, more than 90 percent, already receive some level of digital service. For the Limited Basic customers in Washington who do not have a digital device or CableCARD, Comcast will provide three Digitall Transport Adapters or DTAs at no additional cost. Q. 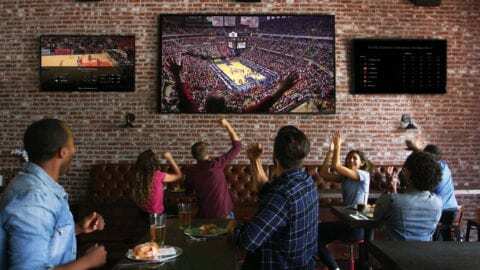 What should customers do to continue watching Limited Basic channels if they have TVs without equipment? A. They have options: To get the equipment, customers can log on to www.comcast.com/digitalnow or call 1-877-634-4434. A representative will be happy to assist and mail the self-install adapters to customers. Q. What are the additional channels that will be available to Limited Basic customers? Channels vary by area, but most customers can expect to see as many as 10 or more channels. Q. Will customers need a digital device if they own a digital QAM tuner TV? A. Technically, customers with a digital QAM tuner TV will be able to continue to get their Limited Basic cable channels without requiring a digital device at this time. However, Comcast strongly recommends that customers utilize a DTA or Cable Card device equipment on all TVs in order to receive programming without interruption. Q: Will customers need a digital cable box or adapter if they have a TV set compatible with CableCARD? A: No, a TV that utilizes a CableCARDdevice to enable delivery of Comcast digital services means that a set-top box or adapter is NOT required for these televisions. A CableCARD is the only equipment required. A. Most customers won’t see a change in their bill. Comcast will provide limited basic customers with up to 3 DTAs at no additional monthly service cost. Customers who currently receive only Limited Basic service will receive up to three free DTA’s, with boxes four and five costing.50 cents a month each. Current Digital Cable customers will not be charged for DTA’s included as part of their service, if those DTA’s were included in their service prior to July 1. New DTA’s purchased after July 1st will cost $1.99 per month for current Digital Cable customers. Q. Will the channel numbers change due to this migration? A. No. There will be no change to the existing channels numbers. Q. What is a CableCARD? A. A CableCARD is a device about the size of a credit card that can be used with a digital-cable-ready television instead of a set top box. If you prefer to use a CableCARD instead of using a Digital Cable set-top box, you will only be able to receive one way Digital Cable channels and will not be able to receive ON DEMAND, pay-per-view and the interactive programming guide. Q: What are your competitors doing? A: All of our competitors require boxes and have for years. Verizon recently announced they are transitioning their FiOS deployments to all-digital, which will require all customers to have equipment on every TV in the home. Similarly, AT&T U-Verse service and both DBS providers (DirecTV and DISH) require customers to have equipment on every TV in the home, and in most cases there are monthly equipment charges for additional receivers. Comcast is taking a more customer-friendly approach on our digital upgrade by offering free equipment and enhanced video services. Q. Is it difficult to get my new cable equipment working? A. No. The Digital Transport Adapter is small and simple. For more information, see our online instructions or watch the video below.